An essential part of the skillset for any 3d print enthusiast is knowing how to take a 3d print and make it not look like a 3d print! The finishing process depends a lot on what material you decide to use, but the basic idea is to either sand or chemically process the material until you cannot see the 3d printed layers. IMHO, Your aim is to get as close to commercial-grade plastic as possible. 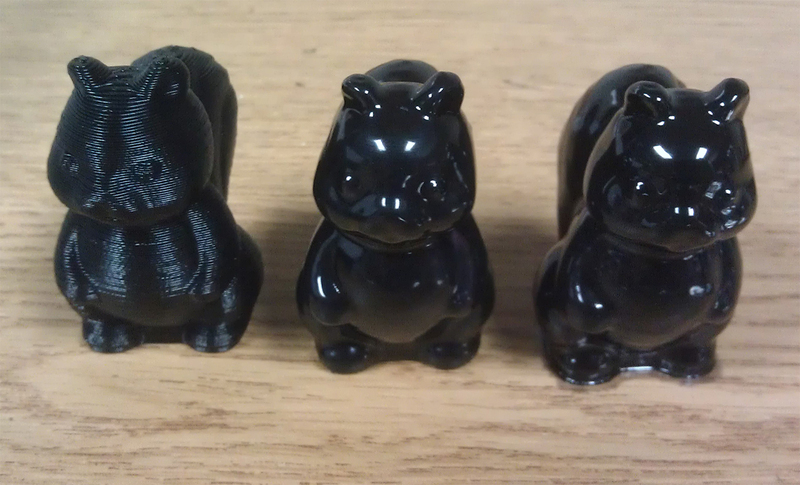 However, some people like to preserve the 3d printed look and just shine it up a little bit. It all really depends on what you’re looking to get out of your surface finish and how much time you are willing to put in. Interestingly enough, if you are 3d printing PLA, you can get the same shining/melting effect with acrylic glue. However, acrylic glue only works if you are using straight PLA. I haven’t had any success getting it to work on some of the infused PLAs (Coffee-infused, steel-infused, carbon-fiber-infused, wood-infused, etc). However, XTC is not as fast as acetone (it takes overnight to cure, while acetone-treated parts cure very quickly). The third method, sanding, is usually best done in combination with XTC or acetone. If you apply coats of XTC or acetone and sand in between, you can get an incredibly smooth surface that is close to injection-molded plastic! To sand a 3d-printed part, I start with 80 grit sandpaper, go over the whole part with it, and then progressively step up the grit and do the same thing repeatedly (going from 80 grit to around 400 grit). You can use up to 1800 grit if you are really particular about the surface finish, but in the higher grits, it becomes harder to see that your sanding is doing anything. Here’s an example of a 3d printed part that was finished with sanding and staining! The part on top of the ninjaflex band was printed in wood-infused PLA. I sanded the PLA starting with 80 grit sandpaper and going all the way up to 1800, and it was incredibly smooth! I then stained the wood-infused PLA with oak stain to give it a relaly nice finish. If you put in enough effort, you can get incredible parts that no one can even tell were made on a 3d printer, so Happy printing! Edit: There is one method I forgot about for finishing 3d prints (Thanks to one of my readers for reminding me! ): high-fill autobody primer. If you spread a layer of autobody primer onto the surface of the part, sand the primer smooth using the techniques I already mentioned, and repeat that as many times as desired.